In an increasingly data-driven world, the way we visualize the massive amounts of information is a key concern. While static data visualizations have their uses, today’s data visualization tools offer a significant upgrade thanks to their customizability as well as their capacity to generate fully interactive dashboards. Interactive data visualizations grant you several benefits, ranging from the purely aesthetic to the more practical. They make dashboards engaging, accessible, and turn massive data sets into easily interpretable visual tools. With such a powerful tool, it’s also important to understand the best ways to maximize its potential and derive actionable insights. Incorporating these tips and strategies can help you take your interactive visualizations to the next level. Consider the end-user for your visualization – Data visualizations in dashboards are tailored for specific audiences—managers, end-users, accountants, HR, and so on. Understanding their specific needs helps uncover the best possible visualization choices as well as the right data and way to express it. Think about the story you’re telling – The data you apply will largely dictate the type of visualization you can use, and the story that data tells will be important to generate the right interactive element for it. Keep visualizations simple – Interactive visualizations work best when they are focused, concise, and eliminate unnecessary graphics, text, and other elements that take away from the data itself. Choose visualizations that can be easily updated – Interactive visualizations in dashboards rarely display static data. Choosing an interactive data visualization that can’t easily be updated will be difficult to use more than once and lose its value in a dashboard. What kind of visualizations should you use? Sankey Diagrams – These visualizations are excellent for understanding and mapping the flow of data or objects. Sankey diagrams are most commonly used to measure web traffic, data flow between network nodes, or energy flow and consumption. Tree Ring Diagrams – These visualizations are ideal for illustrating and mapping out hierarchies between nodes and how data interacts in a network. Collapsible Trees – These tools show decisions as branching paths from an initial point, allowing viewers to map out possible outcomes through several iterations. Heat Maps – These types of maps are excellent when you have data based on geographical locations. For example, comparing per capita rates on a city map can be made dynamic by highlighting heat points on the map, or allowing for comparison between two locations. When should you use interactive data visualizations? Interactive visualizations are not a silver bullet for dashboards, but there are several situations where they can add significant value to your data analysis. One common use of interactive visualizations is understanding the flow of visitors through a website. By deploying an interactive data visualization, a company can track each individual’s journey through their website, including how long they spent on a page, when they left, and which pages they visited. Users can also view aggregate data to understand which pages are popular and which are losing the most viewers. In IT, an interactive visualization could highlight different network configurations, as well as show chokepoints of data and areas where the architecture could be improved. Moreover, a tree ring diagram could visualize the relationship between different parts of the network. For analysts, collapsible trees could show potential outcomes of different investment or risk decisions. Other interactive visualizations could expedite data comparison and create a more holistic view of different data sets to make them easier to explore. (Check out the interactive example below). 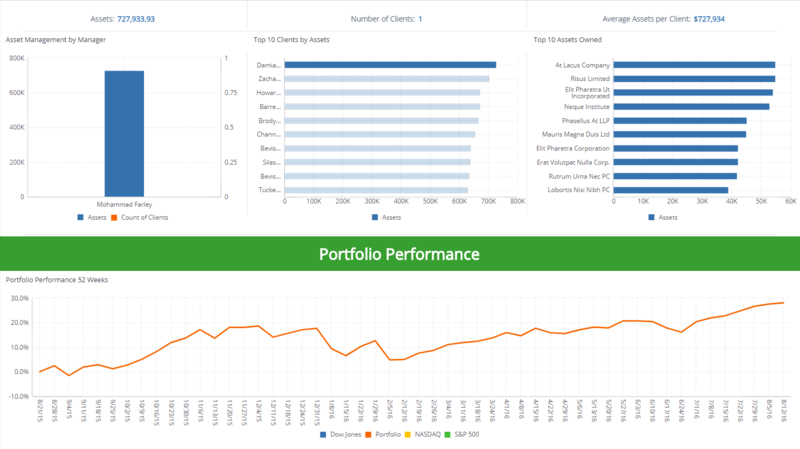 In financial dashboards, interactive visualizations could provide a simpler way to view investments in aggregate and then broken down into specific assets or different categories. Additionally, they could track investments over time and allow for higher specificity. Interactive visualizations offer an easy way to fashion dashboards that are relevant, useful, and engaging. By adding a dynamic element to your data displays, you can add value to your data, keep users interested, and empower them to discover better insights. In a world that is constantly changing, using visualization tools that can reflect these shifts can help you stay ahead of the crowd.